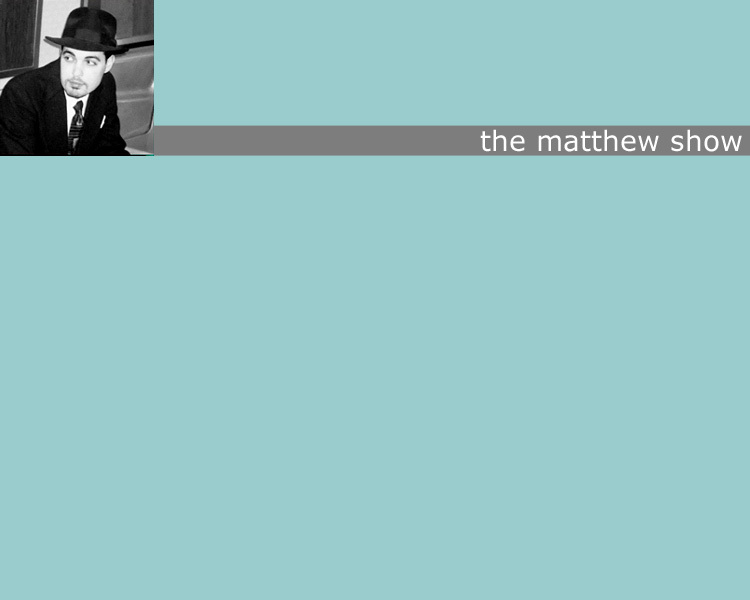 Once upon a time, this was what the website of the artist known as the matthew show (AKA me) looked like. Here's the current one, in case you're lost. I built this site in October of 2002 and operated it until January of 2007, when I turned to more professional types to do that dirty work. At the time I built it, I had the vague notion of making it more than just an artist homepage. I was excited (and still am) about the possibility of websites becoming little destinations unto themselves, expressions of the inner personalities of those running them. I was also in desperate need of something to do. Though I had moved hastily to New York City to avoid financial ruin (sounds completely nonsensical, but it was logical at the time), my studio equipment and the nearly-complete album it contained had not made the trip from Texas yet. Faced with a city full of strangers (save for my wife), mass quantities of culture shock, and hours upon hours of NOT working on music, I turned to writing for this website. As with any experiment, some of the results were well worth the inconvenience, and some weren't. I consider the Letter From NYC the chief triumph of this period, so much so that I fully intend to publish it in book form one day. The Letter is a more or less complete document of my NYC experience, from a couple of days after I got off the plane to the day I got in the van to drive back to Texas. It's nearly 4 whole years in a human being's life, and I still get emails from people who find it comforting, entertaining, and informative. Start from the beginning and do the whole course, you may enjoy it. I've left the few installments of the Letter From TX up, since they track the reverse culture shock that 4 years in NYC will leave you with. Make of them what you will. Recently added a follow-up letter from a brief visit as well, kinda fun. There were other moments worth savoring, particularly the Thoughts that I ever so occasionally took time to come up with. Some of those are better than others, but all are well above average, and occasionally very satisfying. But more important, like the Letter From NYC, they are a perfect reflection of the time and place they were conceived in, and that makes them worth keeping around. The Features were somewhat more dubious. The Forum was mostly of use to my friends and I for lengthy philosophical discussions, and once those petered out, it was largely useless. I'm proud of the two Interviews I managed to pull off, particularly the one with Little Jack Melody. Some of the Reviews are quite good, and the Google Hits Page is just pure entertainment. Among the more questionable Features are Brylcreem vs... and Wizards & Warriors. These were half-baked ideas from the get-go, but they are mildly entertaining. The War Page would've been great, had blogs like Billmon and Daily Kos not gone and done the job far better. Whatcha Hearin' and Whatcha Readin' are an interesting document of the time, but not much else. Two Features that could've been more than they ended up being were Letters From Everywhere and the matthew show radio. LFE was just poorly conceived and badly followed up on, otherwise it could've been an online This American Life. Alas. the matthew show radio actually had a decent listening audience for a couple of years, but with the arrival of my son and the imminent completion of my second album, I had no more time to devote to it. It's the only Feature I really miss. I still think the Life Timeline is brilliant. If I were half the programmer that some of my friends are, I would've taken that thing and run with it. As it is, it's mostly useful to me as a reference point when trying to remember when certain events in my life happened. It's the only part of this site I'm going to keep updating, and really only for my own benefit, but you're free to have a gander. I left my musical history pages up here as well, because some people are interested in that sort of thing. And I occasionally like to hear my old bands' tracks, dated and fumbly as they are. I've also left up the texas album reviews in their entirety, because some of them don't exist online anywhere else anymore. I may add the full texts of any new reviews just to have a good backup of them for future reference. There are other assorted Music goodies, including interviews and other miscellany. My life now contains few moments of truly unaccounted-for time which this website depended on to keep it vibrant. This is a good thing, because my actual musical activity is at a much higher level, as is the amount of time I spend on important things like raising my son and producing my friends' records. This site is an artifact, a true archive, of a time that has passed. Peruse it as you might an old scrapbook of days gone by, never to return. And remember that time must pass, so don't forget to leave a little something of your old self laying around from time to time. I'm glad I did, and I hope you will be, too.